It’s that time of year again where pumpkins have infiltrated my front porch. Don’t get me wrong, I actually get somewhat excited to pickup some pumpkins, and as much as I like taking the kids pumpkin picking, let’s face it, it’s not cheap. That is not to say I was not going to not going to let the fall season go without getting some pumpkins for the kids. After all, I’m in it for the seeds, and so the pumpkin carving started last week as I had a really craving for homemade pumpkin seeds. My default method of cooking the seeds is typically roasting them with butter and salt, however I have also made a version of cinnamon and sugar that my kids also loved, but this year I wanted to make a version just for me. 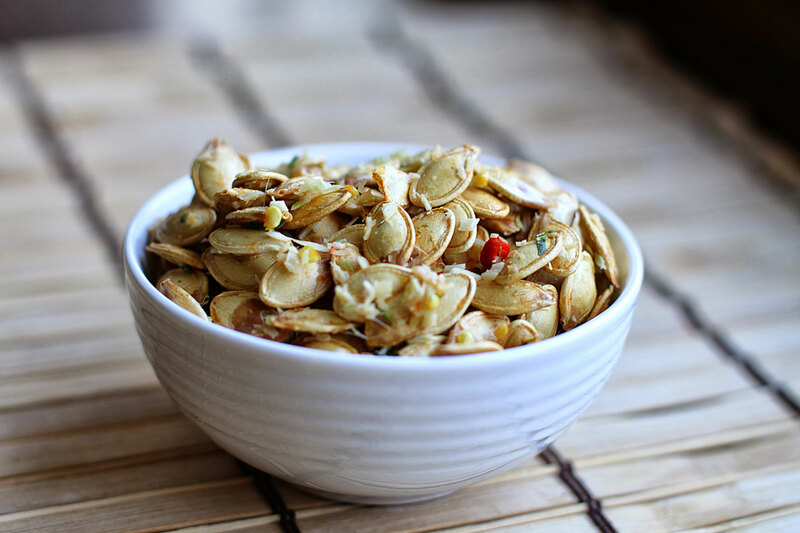 One that was salty, and spicy, hence my version of a Thai style roasted pumpkin seeds recipe. You can tell right off the bat that you are going to get a really infused Thai flavor here with these seeds. Start by rinsing your seeds, making sure any of the pulp is removed. Lay the seeds onto a towel to remove any access moisture. In the meantime, melt the butter and add it to a mixing bowl. Add in the seeds, the salt, and the Thai chili, kaffir lime leaves, and lemongrass. Give a good stir. Preheat your oven to 350 degrees. Line a baking sheet with parchment paper. Add the pumpkin seeds to the baking sheet, laying the seeds evenly on the sheet. Add the seeds to the preheated oven, and cook for about 15 minutes, then remove, toss them around, lay them even again, and roast for another 10-15 minutes, or until they are fully roasted. 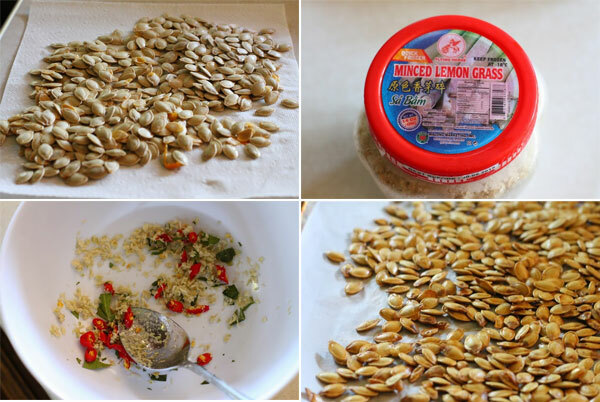 Once cooked, pick up the parchment paper and slide the seeds into your serving bowl. The end result is a blast of Thai flavors in your mouth. You get that great aroma and taste from the kaffir lime leaves, the subtle lemony and ginger bite from the lemongrass, and the heat from the Thai chili. If you have a hankering for those flavors, then give these a try. I hope you enjoy.